Husson student Jarron Nadeau said he was not surprised by the ban, because he thought Trump has done what he said he was going to do. “I think Trump’s trying to stop terrorism, but at the same time, I think that he’s kind of scapegoating Muslims as being the ultimate terrorists when it’s really just extremists,” said Nadeau. There are protests all around the country, including in the Bangor International Airport. 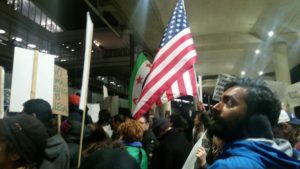 The Bangor Daily News reported that nearly 150 people protested at the airport. “I honestly think that it’s smart to go out there, and share your opinions about things. You’re sharing what you believe, and clearly there’s not just one person that thinks it is wrong,” said Husson student Amanda Marcus. This does not mean the ban cannot go back into effect. The President responded to the appeals court’s decision with a tweet that said, “SEE YOU IN COURT, THE SECURITY OF OUR NATION IS AT STAKE!” This case can go to the Supreme Court. It is important to note that there is an empty seat on the Supreme Court because of the death of Antonin Scalia. Trump’s pick to fill the position will most likely not be approved in time to vote on the issue. If the vote is a tie between the eight judges, the lift on the ban will stay in effect. The point of the 120-day ban is to reevaluate the U.S. Refugee Admission Program, and ensure that all who enter the country do not pose a threat. The executive order said although security has improved since Sept. 11, 2001, there is still more improvement needed. “Refugees attempting to enter and settle in the U.S. are already subject to a vetting process that can take up to two years. First, they’re screened by the U.S. High Commission on Refugees. Those who are selected for possible entry to the U.S. are then subject to vetting by the National Counterterrorism Center, the FBI’s Terrorist Screening Center and the department of the State, Defense and Homeland Security, their biometric information is checked and they undergo personal interviews with DHS officials,” said NPR Washington Desk Correspondent Brian Naylor. After the 120-day period, the Secretary of State, the Secretary of Homeland Security, and the Director of National Intelligence will review the program to determine additional procedures to add. “It seems like he was just targeting these specific places, and I don’t really know in the long run if it’s going to help because, of course, terrorists come from all difference countries, even the United States,” said Husson student Brain Denbow. To read the executive order with annotations by NPR, click this link http://www.npr.org/2017/01/31/512439121/trumps-executive-order-on-immigration-annotated.